> I received a wonderful gift in the mail this week, from my friend, Neil White. As you know if you follow my blog, Neil is the author of the memoir, In the Sanctuary of Outcasts, which I reviewed a while back. But he’s also the Editor of the newly published coffee-table book, Mississippians. There’s something for everyone in this book, whether you’re a sports fan, into music,movies, television and stage, literature, politics or whatever. 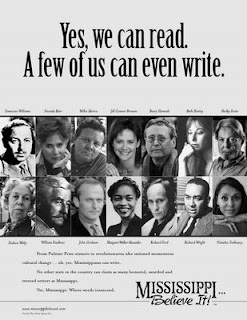 Mississippians would make a terrific Christmas gift, Neil suggests that you buy it from a Mississippi bookseller (see his list here) but you can also order it online. There’s also going to be a launch party on November 2 at Off Square Books in Oxford, and signings at ten different towns in Mississippi and in Memphis over the next few weeks. See the schedule here, and catch up with Neil and get an autographed copy.